BUTOKUDEN has Martial Arts classes for all levels in KENDO, KARATE, NAGINATA, AIKIDO and JODO. On the cultural side, we offer KADO (Sogetsuryu Ikebana Flower Arrangement), and Bushido culture classes. In the olden days in Japan, every major city had a place called BUTOKUDEN. This is where Martial Arts and Japanese Culture were taught to the community, and also a gathering place, where children and young adults were taught the philosophy of Bushido. BUTOKUDEN is located in the heart of Irvine, in Orange County. Please come in for a free trial for any of our classes. 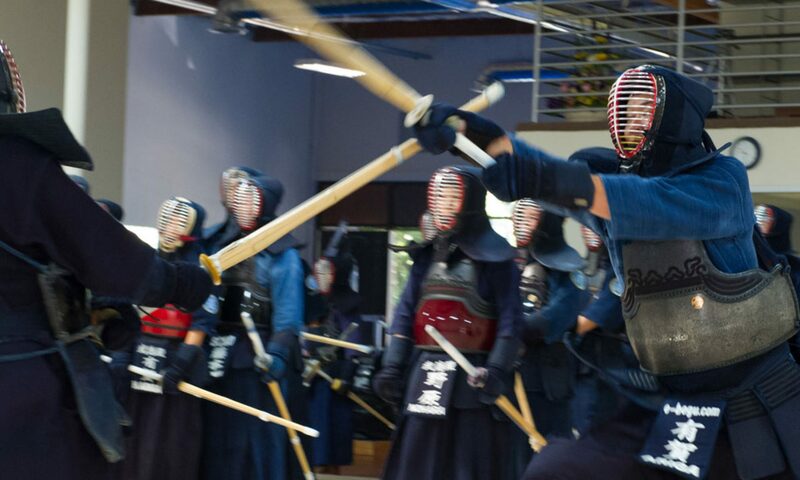 Kendo classes are taught on Tuesdays, Wednesdays and Thursdays, and 3 different age groups. Each class is divided in groups, for advanced and beginners. Classes are taught both in Japanese and English. Our classes are held Mondays, Wednesdays and Saturdays. Our Karate is a branch of Enshin Karate, with the headquarters in Denver Colorado. We offer various age group classes, for Kids and Adults and all levels. Our Aikido Classes are held on Mondays, Wednesdays and Thursdays, and we have separate classes for Kids and Adults. Contact us at aikido@butokuden.com. Jodo classes are held on Mondays. It is a fairly small size class, but with direct instruction from the Sensei. Nagianta Classes are held every 1st and 3rd Saturday of the month. Instructed by Naginata USA Team Players. The purpose of this Bushido Culture program at Budokuden is to learn and appreciate the Bushido history, culture, traditions, customs, manners and etiquette as well as various terminologies and concepts associated with Bushido. The class participants will also learn Japanese zen and zazen concepts through demonstrations, practices, and applications, leading to the mind and body harmonization mastered by the samurai.